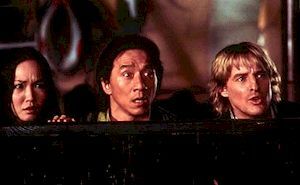 (left) Donnie Yen and Jackie Chan spar, (right) Fann Wong, Chan and Owen Wilson. The Skinny: Another sequel to an American-made Jackie Chan film, which thankfully lives up to the Jackie Chan name. Creative action and genial comedy make this live-action cartoon an entertaining popcorn flick for the masses. This isn't art, but who cares? Jackie Chan returns to the well for Shanghai Knights, a sequel to the modestly successful 2000 flick Shanghai Noon. Chan reprises his role as Chon Wang, who's now a sheriff in Nevada. His old buddy Roy O'Bannon (Owen Wilson) is now located in New York, where he's supposed to be taking care of their accumulated fortune (they appropriated some gold in the last film). Chon is called back into action when he receives a message from sister Lin (Fann Wong), informing him that their father (Kim Chan) has been murdered. Even more, their father was the protector of the Emperor's Imperial Seal, which has now gone missing. The baddie of the piece: a lowly British royal named Rathbone (Aidan Gillen), who wants to ascend to the throne through less-than-noble means. The other baddie: a Chinese turncoat by the name of Wu Chan (Donnie Yen), who has an eye on China's throne. Chon plans to meet Lin in London, where they can hopefully gain revenge on the bad guys and regain the seal. Roy tags along, and the mismatched buddies come up with a stunning game plan: fight and screw around for a couple of hours. We applaud their daring initiative. Shanghai Knights operates off of the same laidback silliness as its predecessor. What that means is the film's driving narrative is often derailed for situation silliness and good old-fashioned buddy banter between Chan and Wilson. Thankfully, the banter isn't half bad. Owen Wilson has a genial laconic charm, and much better chemistry with Chan than that Chris Tucker guy. The banter is sometimes forced, as are the frequent action sequences, but tight screenplays have never been a hallmark of Jackie Chan films. It's just obligatory funny filler between the chasing and punching. That said, the action sequences are wildly entertaining in Jackie Chan's inimitable style. 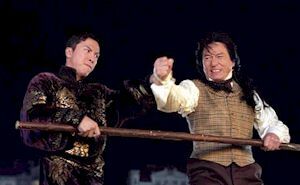 While The Tuxedo and even The Accidental Spy gave us too little of Chan's patented prop-filled action mania, Shanghai Knights is sure to satiate those who find the stuff exhilirating and their reason for admission. Chan bounces off of awnings, uses umbrellas as projectiles, juggles vases with the badguys, and uses citrus fruits as weapons. This is the creative and funny action that drew many of us to Jackie Chan in the first place, and he serves it up here with grace and panache. At the same time, the film delights in its own anachronistic self-referential humor. There are references to silent-era classics, Singin' in the Rain, and even Jackie Chan's previous filmography. Much of the humor can be a little cloying, like the Sherlock Holmes and Charlie Chaplin references. In a minor bit of backwards-congratulations, Jackie Chan even makes Chon Wang an inspiration for Charlie Chaplin! It's obvious that Chan knows where the credit really belongs (uh...Chaplin came first), but the obvious winking at the audience can get a little overdone. Considering Owen Wilson's usual anachronistic comedic style, it becomes too much to have the script do the same. Then again, all of this is in good fun, and it's quite obvious that Chan, Wilson, and everybody else who made the film knows that. All the actors seem like good sports, and nobody attempts to outdo the material. Bad guy Aidan Gillen is appropriately lightweight and sneerworthy, though he looks like he could be a long lost member of the Baldwin family. Unfortunately, Donnie Yen doesn't do any fighting until the final reel, but he handles his villain role with requisite sliminess. Fann Wong is likable and even a little charming in the Zhang Ziyi/Michelle Yeoh role, and complements Chan and Wilson quite well. Chan even lets her steal the show more than once, which could be viewed as progress for the aging action star.